The Stewart Clocktower with the Waldo Library on the left. 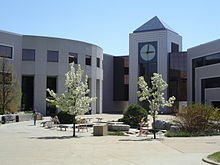 Western Michigan University is a public university in Kalamazoo, Michigan. The university has about 25,045 students. It was founded in 1903. Since 2000, the president of the university has been John M. Dunn. The athletics teams of the university are called "the Broncos". They have 15 varsity teams and they compete in the Mid-American Conference except in men's ice hockey, where they compete in the National Collegiate Hockey Conference. This page was last changed on 16 September 2015, at 03:32.